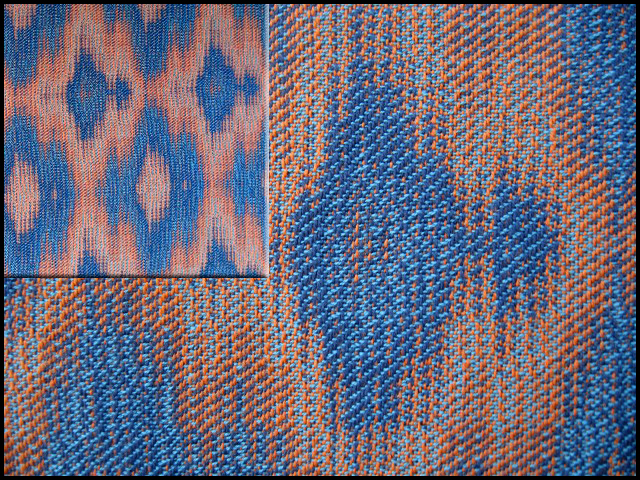 Experimenting with networked drafts with an extended parallel threading, I designed and wove this fabric on 16 shafts, alternating dark blue and burnt orange 20/2 cotton in the warp at a sett of 54 ends per inch and a light blue for the weft. 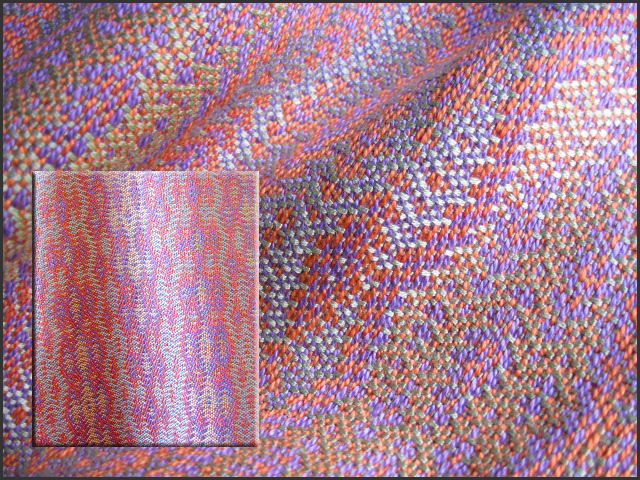 When woven, these three colors blended in interesting ways, not only creating a fourth color but my first weave with an echo! I wove these scarves on 8 shafts using parallel threading and networked treadling. 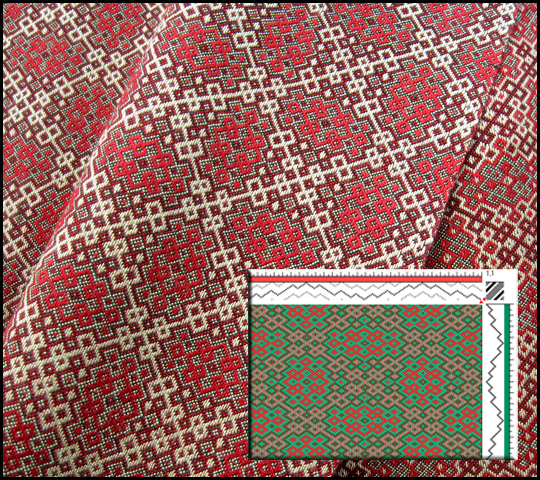 To view the full post with weaving drafts and description of how I designed and wove them, click here. I designed and wove this echo weave scarf on 16 shafts using an extended parallel threading, 5/2 pearl cotton for warp at 24 epi and 2 strands of 20/2 rayon together as weft. To view my post about how it was woven including drafts, notes, and more photos, click here. 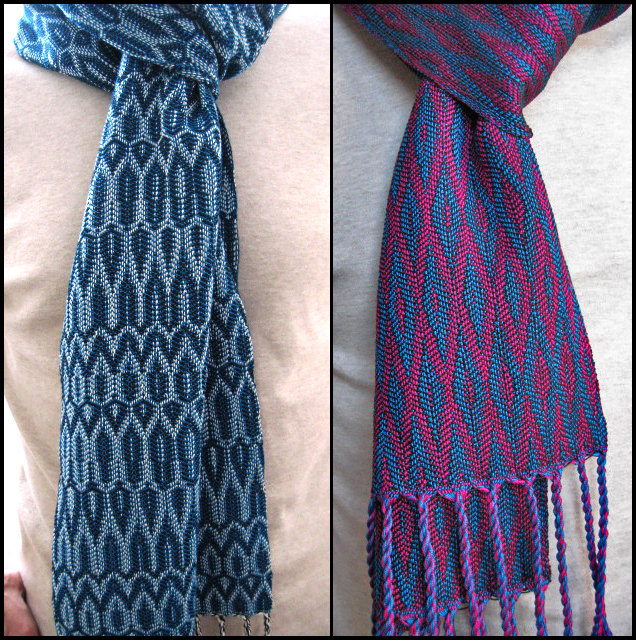 It was so much fun designing the ripples and waves patterns in this fabric and these scarves with network drafting. I wove the pieces using different yarn types and sizes. 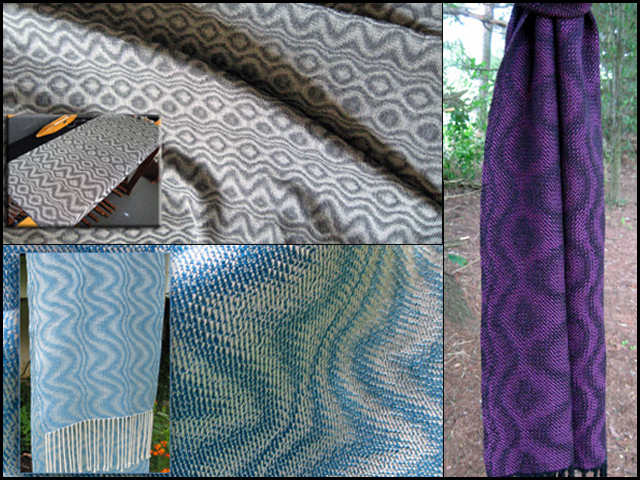 To view weaving drafts and learn more about how I designed and wove these pieces click here. I wove this fabric as my study for the Fine Threads Study Group at Complex Weavers. My study was published as an article, “Gebrochene to Echo,” in the October 2012 (the 100th issue!) of the Complex Weavers Journal, and I posted the content of my article here.